Fish are a most renewable resource. The potential is great for US fishermen to provide the world with quality seafood – if we manage our fisheries well. One hundred years ago agriculture had tamed the American frontier but was relatively unsophisticated. Then came the Green Revolution as farmers, working with scientists, developed modern farming techniques. Farm productivity increased a thousand-fold. In years to come we will see similar gains in commercial and recreational fisheries. The American fishing industry is on the brink of a new era, though there is still a long learning curve ahead. 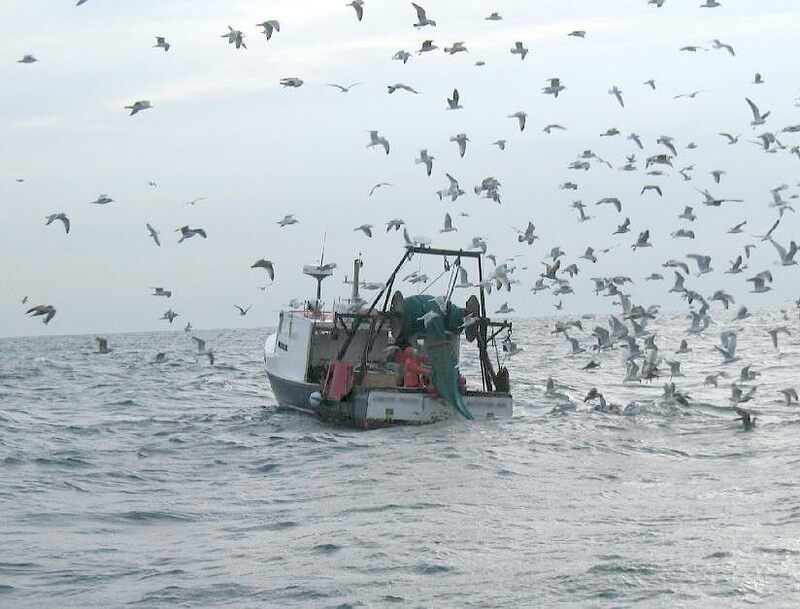 The Northeast Region is a proving ground for this “revolution” in fisheries. The waters from Cape Hatteras, NC to the Gulf of Maine are one of the best studied marine ecosystems in the world. We have great marine science institutions. And though our fishing communities have suffered years of economic turmoil, the people who remain in the business are resilient, resourceful and creative. A new breed of fisherman is emerging – one as likely to carry a laptop to the boat in the morning along with his foul weather gear. In a sustainable fishery information is essential. Good management starts with choices made in the wheelhouse and on the pier. Sustainable fishing is more than simply catching fish. It is about creating seafood quality through value-added or value-preserved. It requires comprehensive planning which gets the balance of incentives right so that when a fishing vessel leaves the dock, the captain is targeting the greatest dollar value of landings with the least environmental impact and cost. Sustainable fishing strategies have many moving parts that have to function as a whole. The elements are as varied as fishing gear design and vessel economics, to information management systems, to seafood marketing. John Williamson has a proven track record in multi-facetted planning for sustainable resource use, with the background and skills needed to build consensus and foster innovation. His professional commitment is toward responsible development of marine fisheries and consumer education. The fishery is under a conservative management plan where scientists set catch limits and all catch is accounted for. The fishermen use “selective” fishing gears which only catch what they want to catch. The fishery as a whole avoids harm to marine mammals, birds and other sea creatures. It has a low ecological “footprint”. The vessels in the fishery are reducing energy consumption through adaptive fishing strategies and information-sharing. The purpose of this website is to promote wise use of our ocean resources. Please take a moment to share your comments or questions on sustainable seafood. I hope you enjoy locally-caught seafood as much as I do! If you are interested in buying locally-caught fish directly from the source, drop me a note (below) and I can refer you to fishermen taking a creative approach. I noticed that you are interested in reducing energy consumption through adaptive fishing strategies and information-sharing. NOAA is planning a symposium on energy use in fisheries and I would love to hear more about any specific efforts underway in the Gulf of Maine. Also, I invite you and interested colleagues to join an online professional network on the topic of energy use in fisheries. The network promotes increased efficiency through discussion and the sharing of resources. Hello, I really enjoyed reading your article. Will bookmark for later. Lots of interesting stuff. Do you know if there’s a harpoon swordfishery in Georges Bank? The foundation was recently contacted by a sustainable seafood consortium asking if we knew of any commercial boats fishing by harpoon only. I couldn’t come up with one. Found you through LinkedIn and thought I’d ask. Thanks. There was a harpoon swordfish fishery on the southern flank of Georges and shelf edge as recently as the late 1980s, vessels primarily out of Cape Cod, New Bedford, and Point Judith. I am not aware that any remnant of that fishery survives. The high-seas long line fishery has surplanted it. But let me make a couple of phone calls and confirm that. I believe that the only way to use the ocean food sources in a sustainable manner, is by modeling. preparing an appropriate model for sustainable fisheries is so crucial. I’ve had one season of experience in Dutch Harbor, Alaska, fishing halibut. This fishery had regulations aimed at sustainability in “the letter of the law” but the spirit was absent. It was because the attitude of most fishermen in the area was not sustainable that the system only served as a farce. I’m interested in seeing evidence that such a concern exists and thrives on an individual basis in Maine. The existence of “Bristol Sustainable Fisheries Coalition”, which I was unable to contact, and your website are both evidence, but I’d like more. I’m not exactly sure what this might be but please offer anything. I’d like to begin a conversation on the subject. If I like what I am presented with I might be prepared to enter the culture and industry myself. At which point I’d like contacts with fishermen. Fred, I appreciate your sentiment. Sustainability starts on the deck of the boat and extends all the way up the management hierarchy. The fact is that there is often a dysfunctional narrative that takes root in the community. You can’t cave to that. But the fishing community is made up of all kinds, and for every yahoo out there subverting sustainable management of fisheries, there are many other people quietly investing in the future of the business and resource. Conservation and sustainable management are the only sure routes to economic success in fisheries, and anyone who is in it for the long term, and has any integrity, figures that out. So what’s your story? Are you fishing now?